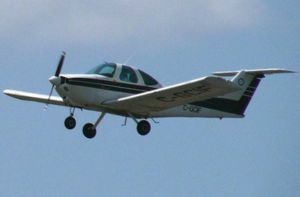 The Skipper, first manufactured in 1979, was Beechcraft's attempt to enter the two-place trainer market with an aircraft capable of competing with the popular Cessna 150/152 line of trainer aircraft. Design work on the Skipper was begun in 1973, with the first flight in 1975. Though the aircraft first flew with a standard tail configuration, by the time it entered production, a T-tail configuration had been adopted. Design similarities between the Skipper and the Piper Tomahawk led to speculation about whether industrial espionage was responsible for the significant parallels. (Both were low wing, used a bubble cabin design, and had a T-tail configuration.) There was never proven to be any substance to the suspicions. The Skipper wing utilizes a GA(W)-1 airfoil, especially engineered for general aviation applications, based on 1970s NASA research. While it is an all-metal design, the Skipper incorporates a number of innovative construction techniques, including honeycomb bonding, tubular spars, and a hot-bonded wing structure. The Skipper had the misfortune of being introduced at the beginning of a severe downturn in general aviation aircraft production in the United States. It was produced only through 1981, with a total of 312 being built. Most of the production run was initially delivered to Beech Aero Centers, where they were used as primary trainers. A handful of Skippers are still in use as trainers. Many others are in the hands of private owners who use them as touring aircraft. This page was last edited on 5 March 2007, at 20:06.